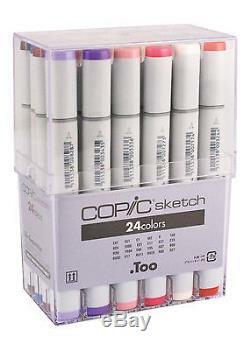 COPIC SKETCH SB24 24-COLOR BASIC MARKER SET. The most popular marker in the Copic line. Perfect for scrapbooking professional illustration fashion design manga and craft projects. Photocopy safe and guaranteed color consistency. The Super Brush nib acts like a paintbrush both in feel and color application. For more control use the Medium Broad nib on the opposite end or customize the marker with an optional nib. Compatible with the Copic Airbrush System. 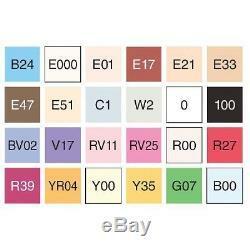 Markers are refillable and available in all colors listed. Set contains markers in 24 colors: Sky Pale Fruit Pink Pink Flamingo Reddish Brass Baby Skin Pink Sand Dark Brown Milky White Cool Gray No. 2 Colorless Blender Black Prune Amethyst Pink Dog Rose Flower Pinkish White Cadmium Red Garnet Chrome Orange Powder Pink Maize Nile Green Frost Blue. We do not mark merchandise values below value or mark items as "gifts" - US and International government regulations prohibit such behavior. All myGoods products are American wattage unless otherwise noted. MyGoods takes no responsibility for products damaged by voltage issues. That is why we try to make things as easy as possible for our valued customers. Non-defective products must be unopened to be eligible for return. Please note: Non-defective opened computer software and video game software may not be eligible for return. We will be sure to reply to your message in a timely manner. Our Hours: Monday-Thursday 9:30AM - 6:00PM, Friday Hours 9:30AM - 3:30PM. Address: myGoods 7 Easter Court Owings Mills, MD 21117. The item "COPIC SB24 SKETCH 24-COLOR BASIC MARKER SET" is in sale since Monday, February 27, 2017. This item is in the category "Crafts\Art Supplies\Drawing & Lettering Supplies\Art Pens & Markers". The seller is "mygoods" and is located in Owings Mills, Maryland. This item can be shipped to United States, Canada, United Kingdom, Denmark, Romania, Slovakia, Bulgaria, Czech republic, Finland, Hungary, Latvia, Lithuania, Malta, Estonia, Australia, Greece, Portugal, Cyprus, Slovenia, Japan, China, Sweden, South Korea, Indonesia, Taiwan, South africa, Thailand, Belgium, France, Hong Kong, Ireland, Netherlands, Poland, Spain, Italy, Germany, Austria, Russian federation, Israel, Mexico, New Zealand, Philippines, Singapore, Switzerland, Norway, Saudi arabia, United arab emirates, Qatar, Kuwait, Bahrain, Croatia, Malaysia, Brazil, Chile, Colombia, Costa rica, Dominican republic, Panama, Trinidad and tobago, Guatemala, El salvador, Honduras, Jamaica.